What upgrades could the Nets find at the trade deadline? 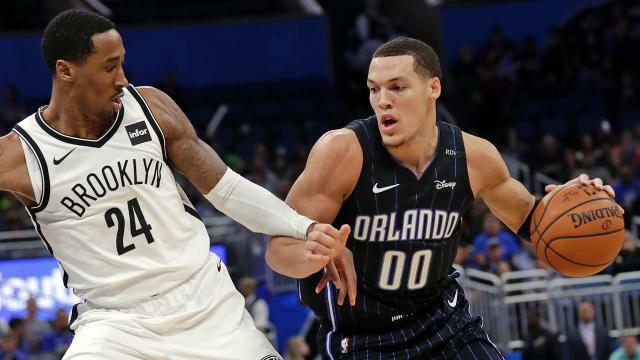 With the NBA trade deadline rapidly approaching, the Nets are a surprise playoff contender that could seek an upgrade. Just one game over .500, the team is in sixth place in the Eastern Conference and has to be optimistic about the weeks ahead with the likes of Caris LeVert and Spencer Dinwiddie expected to return from injury. However, Brooklyn's long-term outlook and the NBA's lack of non-contending teams could make any trades difficult. The Nets are set at guard moving forward between D'Angelo Russell, Dinwiddie and LeVert, despite the recent spate of injuries. Jarrett Allen and Ed Davis lock down the middle, leaving just the wing as sources of immediate improvement, barring an unlikely Anthony Davis pact. Could Brooklyn look to supplement its group of Joe Harris, Rodions Kurucs, and co. with another wing? A power forward capable of shooting 3-pointers would complement the team's starting lineup and rotation, for example. Furthermore, the Nets could seek to add a reclamation project as they did Jahlil Okafor last season, buying low on a former top prospect. Gordon would be the stretchy four Brooklyn is looking for, provided he can adapt to the Nets' playing style. At times pigeonholed into playing small forward and working off the ball in Orlando, he's struggled to find his footing despite earning a long-term deal. ESPN's Zach Lowe floated the idea of the Nets pursuing Gordon on his Monday podcast, and the deal would make plenty of sense. Brooklyn has gotten Russell and others to buy into its system. Why not Gordon? The trade Lowe floated was admittedly impossible by Thursday's deadline as it involved Dinwiddie and DeMarre Carroll, the former who signed an extension in December and is ineligible to be traded until the offseason. If the team believes in Gordon enough, it could trade Russell. Otherwise, this pursuit would have to wait until the offseason, perhaps made more attractive by Gordon's declining salaries. The former No. 9 overall pick should be available via trade despite Charlotte's playoff contention (currently the No. 8 seed). He'll be a restricted free agent after the season and fits the idea of a three-point shooting forward to put next to Allen. The problem is that the fourth-year pro is having his worst NBA season and has fallen out of the Hornets' rotation. He's the definition of a buy-low candidate, yet there's been little indication Charlotte will sell low on him. He's played mostly center in 2018-19 and would be defensively challenged in Brooklyn. The Wizards' December acquisition of Ariza looks even more puzzling as Washington struggles to contend in the East. They're still a few good weeks from cracking the top eight, but Washington could also just flip Ariza to recoup assets. He'd also be attractive on the buyout market. As a pending free agent, it's unlikely he fetches more than a couple second-round picks. If the Wizards are willing to deal him, the Nets should be all over Ariza, as should essentially any NBA team. He represents a wing upgrade for any rotation and provides the always desired veteran presence. The Pelicans appear willing to tear things down after Anthony Davis requested a trade, and Mirotic would be one of the most attractive trade assets. He's an unrestricted free agent after this season, so he would only shore up the Nets' frontcourt in the short term. But he's the type of player that would fit the team to a tee. He can play 30 minutes a game, shoot a decent clip from long range and generally find ways to score. His teams have always had a positive net rating with him on the court. What would he cost? He's tricky as it could take a heavily-protected first-rounder or an intriguing young asset to pry him from the Big Easy. Nonetheless, the 27-year-old power forward could be worth the price for this season. Beyond Ariza, there could be some intriguing players that reach the market after Feb. 7. The Knicks' combo of DeAndre Jordan and Wesley Matthews certainly fit that mold with the latter making sense for practically any contender. The Cavaliers' Channing Frye adds a veteran presence with a dash of 3-point shooting, like Jared Dudley does when healthy for the Nets. Phoenix's Ryan Anderson and Miami's Wayne Ellington also fit the bill of sharp-shooting targets. What former first-round picks could be available? The Nets may not have the room to take a flyer on that type of player given their playoff hopes, but there are always players of that ilk on the market. Dragan Bender, the No. 4 overall pick just a few seasons ago, has fallen out of the Suns' rotation and has seen his shooting crater in a small sample. Still the 7-foot-1 forward is just 21 and has plenty of potential despite the Suns seemingly giving up on him. In Detroit, Henry Ellenson has played in just two NBA games this season. The third-year pro was a sharp-shooting forward at Marquette but it hasn't translated to the NBA. The Pistons should be willing to part with the 22-year-old, so any team with hope for the G-League vet may take a look.